Locking is the generic term used to refer to the database management system function that is required for managing interprocess concurrency and maintaining data integrity. However, locking is just one of the serialization mechanisms available in IBM® DB2® for z/OS®. DB2 uses different mechanisms for serialization to achieve its goal of maximizing concurrency without losing integrity with a minimum cost in CPU, I/O, and storage resources. 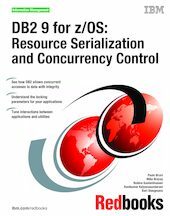 In this IBM Redbooks® publication, we review and explore the different serialization mechanisms used in DB2, such as transaction (DML) locking, claims and drains, restrictive states, latching, and optimistic serialization. This book was written for application developers in order to help them better understand serialization mechanisms and how they influence application design decisions.